The Geochron is the only mechanical clock ever made showing the Grey Line in real time. 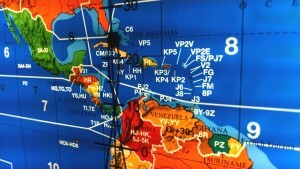 A mark of distinction in ham radio shacks around the world, the Ham Radio Edition has been updated with a luminous map with details important to Ham radio operators on the richest mapset ever seen in a Geochron, since 1964. Prior to the 90’s and the advent of the Internet, the only way to know where the Grey Line was with a Geochron. Now, Geochron introduces a mechanically and graphically updated version of the Standard Geochron first available in 1964. Real Wood Hickory, or Polished Stainless? 17 different options to match your décor. See your custom build online by starting with our models. Upgrade to a more brilliant and detailed premium map, showing the mountains of the deep ocean and more. 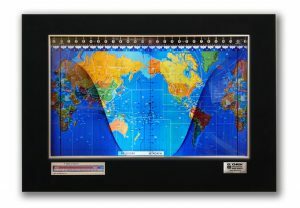 Learn more here..
Equatorial, latitude & longitude, and tropic points of reference. The Grey Line against a Mercator projection. The Month, Day, and hour of every time zone on earth, including Zulu time. The Analemma, showing the sun’s position at relative noon. Compact Fluorescent Lighting: This Geochron uses only CFL lighting system, and is a bit softer in appearance than our standard LED Lighting system that emits measurable QRM at 7 mhz. 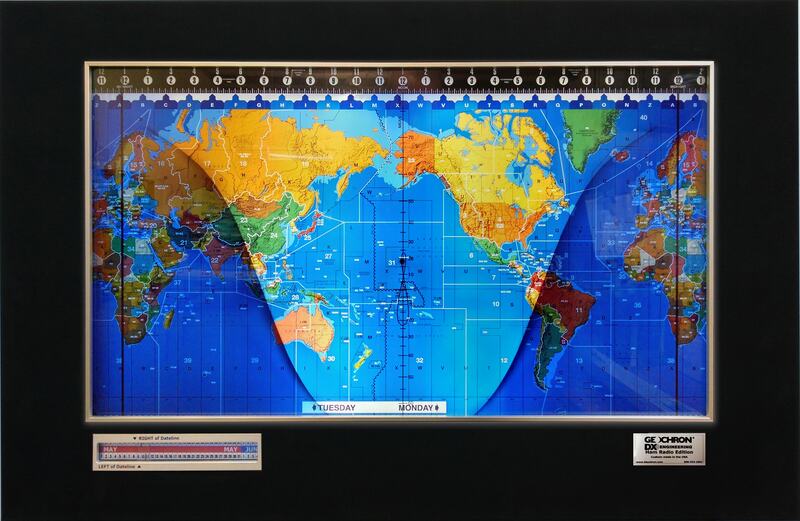 Premium Quality Mapset: For the first time in any Geochron World Clock, we’re using a special photographic print process (Lambda) to create our six foot long mapset. This analogical process is specifically for backlit photographic media, and the colors appear richer than the traditional offset print process. This model of Geochron is only available through DX Engineering, our partner on this special project. DX Engineering has the Ham Radio Edition in stock for immediate shipping starting at $1,899. A Kilburg build, which adds a minute dial. 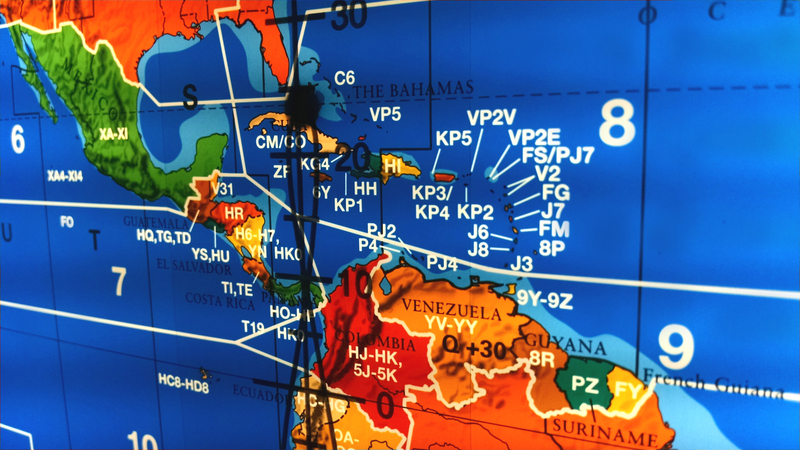 To order a custom Geochron with a Ham Radio Map, see our Kilburg and Boardroom models and add a Ham Radio Mapset an option… or call us at 800-342-1661. 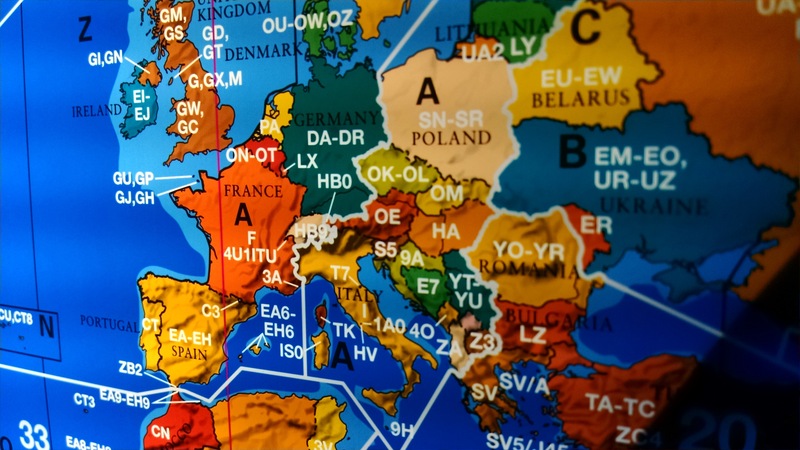 Already have a Geochron, but want a new Ham Radio Mapset? It’s six feet long (video)! Just the Map: Send us the clock, and we’ll do it. Includes return shipping and new mapset. $299.00 (shipping not included). If you don’t have your original shipping carton, we’ll send you one here. As part of a Rebuild: We’ll completely strip your clock down, and make it like-new. Rebuild details here. 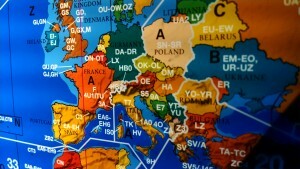 Add a Ham Radio mapset for $99.00 + the cost of the rebuild. You install: Please read the map replacement instructions before you purchase the map below. $229.00 (shipping to USA included). Order online below..
DX Engineering distributes the DX Ham Radio Geochron in a Black Vinyl Goatskin panel, our most affordable Ham Radio Clock and can be purchased directly from DX Engineering. 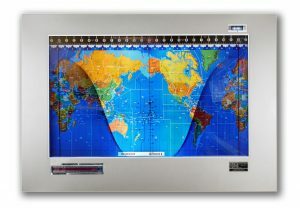 All other panel configurations with a Ham Radio Mapset are available here at geochron.com. All clocks are made in our shop in Portland, Oregon.